Today almost everyone in the developed world spends time online and anyone involved in strategic communication must think digitally. The magnitude of change may be up for debate but the trend is unstoppable, dramatically reconfiguring business models, organisational structures and even the practice of democracy. Strategic Communication, Social Media and Democracy provides a wholly new framework for understanding this reality, a reality that is transforming the way both practitioners and theoreticians navigate this fast-moving environment. 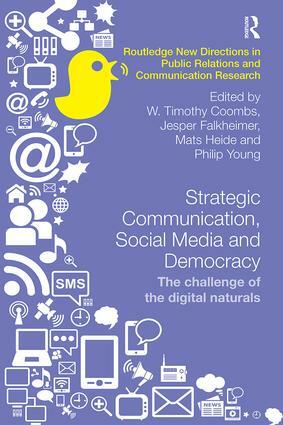 Firmly rooted in empirical research, and resisting the lure of over-optimistic communication dreams, it explores both the potential that social media offers for changing the relationships between organisations and stakeholders, and critically analyses what has been achieved so far. This innovative text will be of great interest to researchers, educators and advanced students in strategic communications, public relations, corporate communication, new media, social media and communication management. The role of communication professionals in the digital age – old paradoxes, new distinctions? The dream of enlightenment within digital reach? What do digital naturals demand from democracy?